RPU customer service will be closing at 4:30 on Wednesday, January 27. From 4- 4:30 only payment drop off will be available. ROCHESTER, MN— Rochester Public Utilities (RPU) will be hosting meetings for commercial customers and trade allies on February 2 at the Ramada Hotel and Conference Center. The trade ally meeting will begin at 7:30 a.m. and the commercial customer meeting will begin at noon. Both meetings will include a meal, information on new energy efficiency programs available, and rate forecasts. In addition, there will be a presentation from Ray Lyons from Leeson Motors on buying energy efficient motors, as well as the changing efficiency requirements that will take effect later this year. An opportunity for questions will follow along with time for handing out prizes at the end. 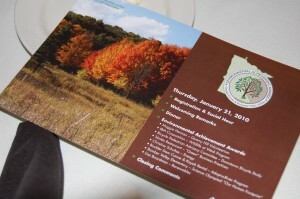 Additional sponsors include People’s Cooperative Services and Minnesota Energy Resources. For more information on the trade ally or commercial customer letter, visit www.rpu.org and click on the link for commercial customer and trade ally meetings. The 2009 Environmental Achievement Awards were handed out at an award ceremony last night held at the Rochester Golf & Country Club. Recipients were recognized for their efforts toward helping the local environment in Rochester and Olmsted County. Pictures from the event will be posted soon. The RPU Online Access Center will be down during the morning of Saturday, January 23 for upgrades. During this time you will not be able to make payments online or access your account online. We appreciate yor understanding. ROCHESTER, MN- Rochester Public Utilities (RPU) will continue performing routine de-icing along certain parts of Silver Lake throughout the winter months. Routine de-icing is necessary to sustain power plant cooling water system operations and to properly control Silver Lake water level. This work affects the ice thickness on Silver Lake in several locations. During this time and throughout the winter months, RPU warns of thin ice and reminds people in the community to stay off the lake. Although, ice may look thick and safe to walk on, it still may not be safe to hold any amount of weight. In the event that you see a person on the ice, please contact local law enforcement immediately. You are currently browsing the Rochester Public Utilities | Behind the Meter blog archives for January, 2010.